Who is Responsible for My Injuries at the Airport? At the Wolfson Law Firm in Miami, our personal injury lawyers have represented victims of negligence who were severely injured at an airport. We have seen the ways people can be suddenly and unexpectedly injured at any airport in South Florida. If you were injured at any airport, we invite you to call for your free consultation with our airport accident lawyers in Miami, Fort Lauderdale and West Palm Beach by calling (855) 982-2067. Depending on the type of accident that causes an injury will determine the responsibility for your damages. In a car accident, our car accident lawyers would investigate the facts of the accident. If the other driver was at fault, then we would pursue that driver. If that driver was uninsured or did not carry enough insurance to compensate you for your injuries, we would look to your insurance policy or any policy in your home for uninsured/underinsured motorist coverage. 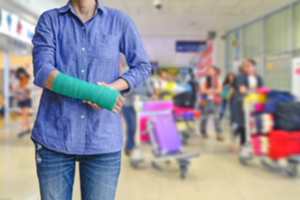 In accidents involving a fall caused by slips, trips or steps, our airport slip and fall attorneys would place the airport on notice of our representation and your injury claim. We would also request that the airport preserve any video surveillance of your accident in addition to the 24 hours before and after the incident. Oftentimes, with multiple defendants it becomes necessary to file a lawsuit because until litigation commences each of the potentially responsible parties will point at the other parties. That leads to the wasting of time and frustration for you and your family. Once a lawsuit is filed, then all the defendants are required to comply with the rules and deadlines of the court system. That leads to your case being settled at mediation or tried before a jury but at least there is an endpoint. At the Wolfson Law Firm, our South Florida airport injury lawyers are here to help you if you or a loved one was injured at any airport in Florida. We are available by appointment at our offices in West Palm Beach, Fort Lauderdale or Miami. We are also available by text, Skype or a simple call to (855) 982-2067. Our Miami personal injury lawyers proudly serve the communities of Miami, West Palm Beach, Fort Lauderdale, Hollywood, Boca Raton, Hialeah, Wellington, Miami Beach, Aventura, Weston, Pompano and Miami Gardens.